If you’re passionate about animals and want to join a team of like-minded caregivers, come to Doggy Dates for dog walking jobs. Wellesley individuals who are reliable, trustworthy, and love dogs will be a perfect fit here. We are always looking for personable and dependable dog lovers in Wellesley, Natick, Dover, Needham, Weston, Sherborn, and Wayland to join our team. 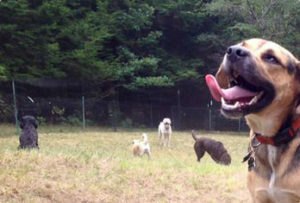 Whether you want to dabble in dog walking with occasional dog sitting or jump in as a full-time playdate supervisor, Doggy Dates has the ideal career for you. Why Work for Doggy Dates? Elizabeth Geisinger, CEO and founder, created Doggy Dates to bring together her love of dogs and entrepreneurship. Doggy Dates has taken care of dogs throughout Massachusetts since 2011, with nothing but positive reviews from clients and employees. Read our testimonials. We provide playdates, overnight sittings, training, and dog walking jobs in Wellesley to yuppie puppies that need our care. We have become a popular and trusted doggie daycare and employees earn a reliable source of income. When you work for Doggy Dates, you enjoy a fulfilling and satisfying career – not to mention we pay you to play with dogs! This is a fun and interesting opportunity for dog walking jobs in Wellesley. Our doggy playdates made us famous, but as an employee, you choose which types of jobs you want to take. Whether you’re comfortable being an overnight provider or simply prefer to perform occasional dog walking duties, you’re wanted on our team. At Doggy Dates, you enjoy total flexibility and full control of your responsibilities. Don’t wait to apply for a job! With a job at Doggy Dates, you join a team of people who care about dogs as much as you do. From certified dog trainers to those who switched careers to follow their dreams, we are hiring all kinds of animal lovers. No matter where you see yourself at Doggy Dates, if you love dogs you’ll fit right in. Our only prerequisites for dog walking jobs in Wellesley are that you’re reliable, personable, and love dogs as much as we do. If this sounds like you, a Doggy Dates job may be an ideal fit. When you work for Doggy Dates, you’re much more than just a dog walker. You’re best friends with your furry clients. When you’re a client’s go-to dog walker, you become part of the family. A dog’s unconditional love is contagious, and we know you’ll look forward to seeing your new best friends daily. If you’re looking for a dog walking job in Wellesley you can be proud of, find it at Doggy Dates. Doggy Dates is a popular destination for pups that need to get off the leash, socialize with other dogs, and enjoy wide-open spaces. Our mission is about more than just exercise – it’s about making a dog happy and comfortable. We pick up a dog up from its home and transport him in our own customized Scion XB to a privately owned, fenced plot of farmland. It’s where a puppy runs, plays and barks to its heart’s content. Our dedication to each furry friend we take care of shows in our work, making us a top destination for doggie day care throughout the greater Boston area and Massachusetts. Our playdate service expends pups’ excess energy and minimizes bad behavior. When we return Rover to his home, he’s a happily-exhausted pup from a full day of running, playing fetch, and interacting with new furry friends. Our playgroup supervisors take the time to learn each of our canine clients’ playing styles, preferences, and personalities to ensure they have good, safe fun. If you’re interested in hosting dogs at your own home or overnight in someone else’s home, we hire dog sitters for these jobs as well. As long as you’re friendly, trustworthy, and treat all dogs like your own, you’re wanted! We’re happy to accommodate your goals and schedule. If transporting dogs to day care or hosting them overnight are out of your comfort zone, don’t worry! These are just two of the services we offer. We also have opportunities for dog walking jobs in Wellesley, where you stop by clients’ homes and take pups around the block for daily exercise. Is a Dog Walking Job in Wellesley for You? Dog walking is physical. Walking dogs for a living requires a certain level of physical stamina and technical skill. If you’re corralling a few dogs at once, for example, you’ll have your hands full with a pack of running paws and need to have the ability to keep them within your control on the trail. Dog walking requires a bit of know-how. You don’t have to have a degree in animal behavioral science to qualify, but it does help if you’ve owned a dog yourself or have had experience with dog handling. Understanding dog behavior, pet first aid, and city dog-walking laws are all a plus. Dog walking takes time management. While Doggy Dates is a flexible workplace, there are certain expectations you must live up to. Once you set a date with a client, you must arrive on time as expected. Our doggy playdate sessions run Monday through Friday in early morning (8 to 9:30), mid-morning (10 to 11:30), and early afternoon (noon to 2:30) – rain or shine! Punctuality is a must. If you believe you’d be a good fit at Doggy Dates, we encourage you to fill out our application form. If we agree that you’re an ideal candidate for dog walking jobs in Wellesley, we’ll contact you to take the next step. Doggy Dates is a wonderful opportunity for people looking for an outside-the-box job working with furry friends every day. To learn more about Doggy Dates’ dog walking jobs, Wellesley residents can call us at (781) 801-2526.